JACKSONVILLE, Fla. — A study of more than 2,000 patients by researchers at Mayo Clinic’s campus in Jacksonville, Florida, has dispelled the myth that cancer biopsies cause cancer to spread. In the Jan. 9 online issue of Gut, they show that patients who received a biopsy had a better outcome and longer survival than patients who did not have a biopsy. The image shows a pancreas tumor being biopsied with a needle as visualized by endoscopic ultrasound. The endoscope was located within the stomach (passed via the mouth). An ultrasound probe at the tip of the endoscope allows visualization of the pancreas which is located immediately next to the stomach. A long needle is guided through the endoscope and into the tumor under ultrasound guidance. The researchers studied pancreatic cancer, but the findings likely apply to other cancers because diagnostic technique used in this study — fine needle aspiration — is commonly used across tumor types, says the study’s senior investigator and gastroenterologist Michael Wallace, M.D., M.P.H., professor of medicine. 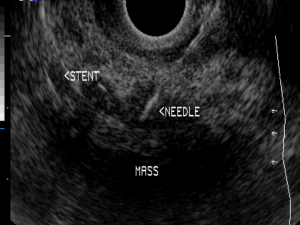 Fine needle aspiration is a minimally invasive technique that uses a thin and hollow needle to extract a few cells from a tumor mass. A long-held belief by a number of patients and even some physicians has been that a biopsy can cause some cancer cells to spread. While there have been a few case reports that suggest this can happen — but very rarely — there is no need for patients to be concerned about biopsies, says Dr. Wallace. Biopsies offer “very valuable information that allow us to tailor treatment. In some cases, we can offer chemotherapy and radiation before surgery for a better outcome, and in other cases, we can avoid surgery and other therapy altogether,” Dr. Wallace says. Surgery for pancreatic cancer is “a very big operation,” and “most people should want to make sure they have cancer before they undergo surgery,” he says. One study has shown that 9 percent of patients who underwent surgery because of suspected pancreatic cancer actually had benign disease. Dr. Wallace and his team have conducted two separate studies to examine the risk of biopsy. In a 2013 study published in Endoscopy, the researchers examined outcomes in 256 pancreatic cancer patients treated at Mayo Clinic in Jacksonville, Florida. They found no difference in cancer recurrence between 208 patients who had ultrasound-guided fine needle aspiration (EUS-FNA) and the 48 patients who did not have a biopsy. In the current study, they examined 11 years (1998–2009) of Medicare data on patients with non-metastatic pancreatic cancer who underwent surgery. The researchers examined overall survival and pancreatic cancer-specific survival in 498 patients who had EUS-FNA and 1,536 patients who did not have a biopsy. During a mean follow-up time of 21 months, 285 patients (57 percent) in the EUS-FNA group and 1,167 patients (76 percent) in the non-EUS-FNA group died. Pancreatic cancer was identified as the cause of death for 251 patients (50 percent) in the EUS-FNA group and 980 patients (64 percent) in the non-EUS-FNA group. Median overall survival in the EUS-FNA group was 22 months compared to 15 months in the non-EUS-FNA group. “Biopsies are incredibly valuable. They allow us to practice individualized medicine — treatment that is tailored for each person and designed to offer the best outcome possible,” Dr. Wallace says. Co-authors include researchers from Mayo Clinic’s campus in Rochester, Minnesota. Congratuation Chrissy! You were an great charge nurse and fellow coworker on Gonda 9.